A SHIELD IS A large, tectonically inactive mass of Precambrian crystalline rock that underlies most of a continent. (Another name for a shield is craton.) A shield’s rocks are igneous and metamorphic in origin and contain some of the oldest rocks on Earth. 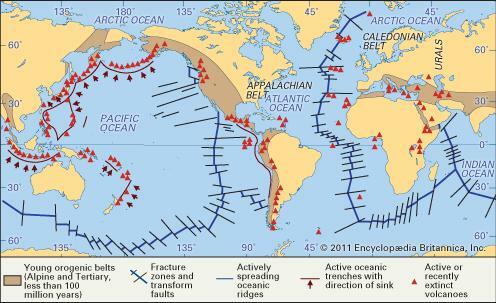 In zones of tectonic plate convergence, mountain systems that are actively building often mark the edges of shields. Younger-aged sedimentary rocks hide large areas of most shields. The younger rocks, ranging in age from the Paleozoic through the Cenozoic eras, accumulated during times when large inland seas covered the shields. The marine rocks can be thousands of feet thick. Fluvial and glacial erosion have exposed parts of the shields. The topographic surfaces of the exposed areas include plains, low hills, and low plateaus, although there are exceptions where tectonic forces cause large crustal blocks to uplift. Erosion has exposed parts of all continental shields, aside from the East Antarctic shield, which an ice sheet totally covers. The CANADIAN SHIELD, which underlies most of North America, is a good example of a partially exposed shield. A Pleistocene ice sheet, which existed between about 1.8 million and 15,000 years ago, eroded and exposed the northern half of the shield. The exposed area surrounds Hudson Bay and consists mostly of the Laurentian Plain. The plain is a low-lying surface pockmarked with glacial lake basins, bare rock, thin soils, and a helter-skelter veneer of assorted glacial deposits. A thick mantle of glacial deposits overlying marine sedimentary rocks covers the shield immediately south and west of the Great Lakes basins. The glacial deposits end at the Ohio and Missouri rivers, but the marine sedimentary rock cover continues farther south and west. The break up of Pangaea gave rise to northern and southern shields: the Laurasian shields and Gondwanan shields, respectively. The Laurasian shields include the Canadian Shield; the Greenland Shield; the Scandinavian Shield in NORWAY, SWEDEN, FINLAND, northern Europe, western RUSSIA, and UKRAINE; and the Siberian Shield in north-central Russia and Central Asia. The Laurasian shields have areas exposed due to recent (Pleistocene) glaciations. The Gondwanan shields include the Brazilian and Guyana shields in South America as well as the African, Indian, and Australian shields. Glaciations partly exposed the Gondwanan shields before Pangaea’s breakup (225 million years ago). Exposures that are more recent are due mainly to fluvial erosion.